Creative ideas always come flowing freely. Because freedom is what causes many automotive modifiers explore the idea of building a vehicle. They are free to use parts that are taken from various brands (not fixated on one particular brand). Then combine them in a single work in accordance with the initial idea modification. 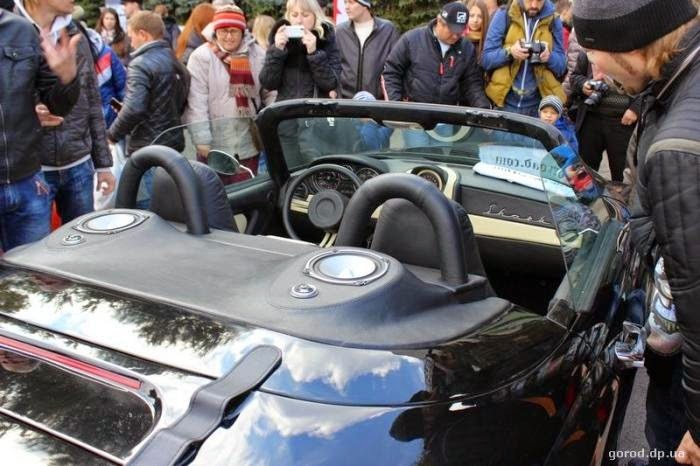 This is very clearly shown by Aleksandr Gorun, a Ukrainian artist and automotive modifier in building a roadster modification named 'Shark.' In his studio in Sevastopol, he and his colleagues has managed to build a car by using many parts that taken from different cars. 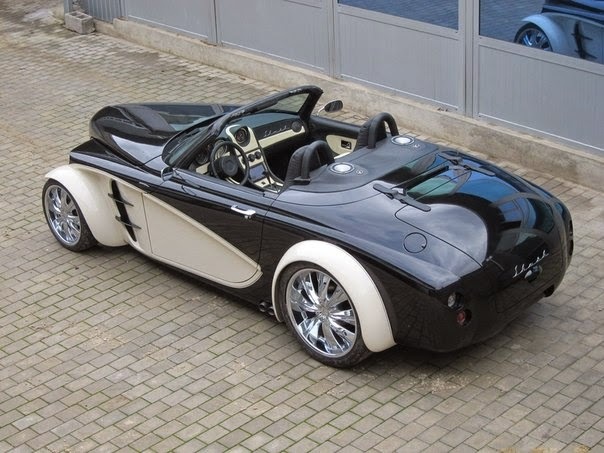 For example, this roadster uses the chassis and engine of the Mercedes-benz, and a removable roof taken from Fiat Barchetta. 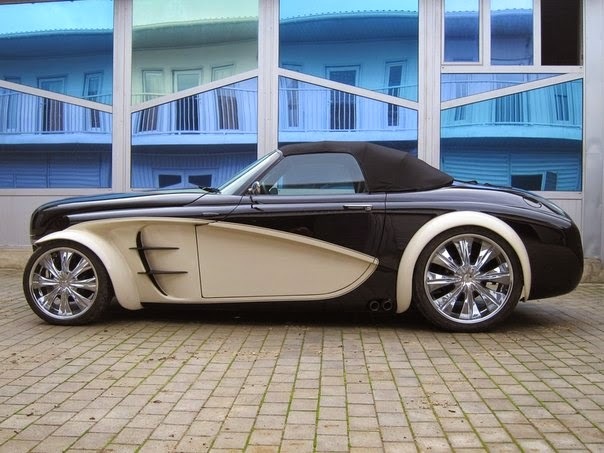 As mentioned above, this unique roadster uses a Mercedes-Benz's engine that has a capacity of 3,200 cc and combined with automatic transmission system that taken from the same brand. Most of the parts were custom made by their own hands, some bought through the Internet. On the exterior, the car has a unique shape and reminiscent of typical forms of the hotrods and cars of 1940s - 1950s, especially on the front. Then the classic custom grill attached in very low position. 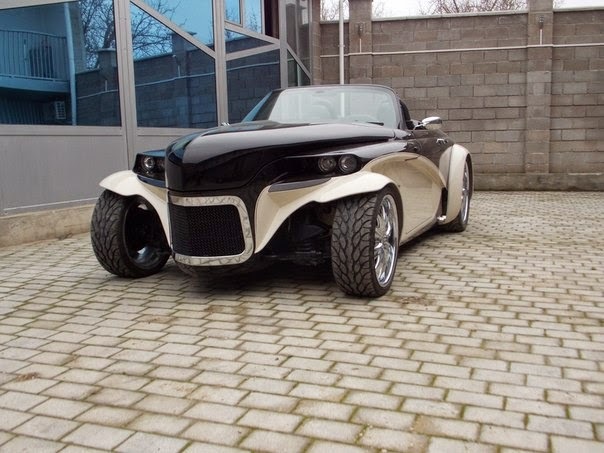 At the front, this roadster uses a pair of Zora 965C rims measuring 18" and covered by BF Goodrich g-Force 225/35ZR18 tires while the rear 22" rims and covered with 285/35ZR22 tires. While the interior of the two passenger cars using the dominant color black on all of its interior elements such as the dasboard which contains a number of instrument panels. And a pair of seats swathed in black genuine-leather. Overall roadster was very beautiful in a contrast color blend, black-and-white.